HUNTSVILLE, Alabama — The white tablecloth looked a little bit like a crime scene after we finished our dinner at The Bottle. A few drops of basil oil there. Some molasses whiskey sauce here. Demi-glace there. But you don’t spend a whole meal sharing bites back and forth across the table if the food isn’t amazing, which it was on a recent evening, about two weeks after the new downtown fine-dining spot opened. I’ve had a few steaks in my time. And The Bottle’s Angus Beef Filet Mignon ($29) is in the upper echelon. A huge, in-house cut resting in a shallow pool of rich, classic French demi-glace. The filet was topped with two pats of red wine rosemary butter, which looked a little odd, like two misplaced buttons, but teamed with the demi-glace for complex secondary flavors that enhanced the steak without getting in its way. Ordered medium, that’s exactly how the streak arrived on our table. Tender yet with a deft, super-slight crispiness on the edges. Powerful. Immaculate. Damn. The filet was served with super-smooth mashed potatoes that balanced countryside and couture. Some nifty, buttery, perfectly crisp haricot verts – aka fresh green beans – also co-starred. After our fantastic server Laurel told us all seafood on The Bottle menu had just been flown in today, ordering the Georges Bank Jumbo Sea Scallops ($24) seemed academic. Three scallops each about the size of bling dangling from a rapper’s gold-chain. You could definitely still taste the gulf on these things, smooth-muscle texture and, like the filet, cooked with delicate-crispy surface edges. And some zest to jazz the end of your tongue. The scallops were artily plated atop curried couscous and haricots verts. I’ve never been that gonzo about couscous but these had a dichotomous, heavy-but-light thing happening, and benefitted from the orange beurre blanc’s muted-citrus tang. We started off our meal with two appetizers: Pastrami Cured Yellowfin Tuna ($12) and Chicken Fried Quail ($11). The tuna … wow. Obscenely fresh, brisk taste and texture, and a must-do. Served with wakame (electric-green seaweed salad) and plated atop sriracha and soy zig-zags. I’m a quail novice. So there was a learning curve for knowing which parts to eat without ending up with some bone. Still, the quail’s delicately fried, rustic taste melded like magic with the accompanying, luscious bacon cheese grits and religion-starting molasses whiskey sauce. The meal crescendo-ed to a finish with the Triple Cheesecake ($7). The “Triple” is a reference to sweet, savory and spicy tastes, and not three types of cheesecake stacked on top of each other. Served in a half-sphere shape, the cheesecake was fashioned from goat cheese, giving it a significant density and clicking “savory” off the to-do list. Diced mango added tropical burst, while a caramel smudge imparted sugary lift. And some tiny yellow bulbs – created in a process, that if I heard right, involves liquid nitrogen – contributed sour-lemon, jalapeno bite. Sophisticated and smashing. Our service was laser-sharp. Classic French style – crumber alert! – rendered with passion and down-to-earth warmth. Thanks again, Laurel. There were very few aspects of our Bottle experience that could be tightened up. The Chilton County Peach and Goat Cheese Salad ($8) benefitted from cloud-soft chunks of Humble Heart cheese, buoyant-fresh greens, blueberries and pecans. But the salad was light on peaches themselves, especially given the dish’s name, and the peach vinaigrette was a little too quiet. On the other hand, our Local Fried Okra and Heirloom Tomato Salad ($6), served with balsamic vinaigrette, was money. About two-thirds of the way through our meal, The Bottle’s stereo system abruptly came to life, playing Kenny G-style smooth-jazz at a fairly robust volume. Jazz is a good fit here. But maybe shoot for some Coltrane or Miles instead of elevator music, guys? The Bottle dining room features earth-tone paints and vintage-looking overhead light fixtures casting mellow light. We sat in front of one of the large picture windows granting a view of Washington Street. After day turned to night, a street lamp lit our table. Pretty cool. The handsome bar boasts marble flooring and wood paneling, which you’ll recall if you’ve been here during the space’s previous incarnations as Pauli’s Chop House or, most recently, the James Boyce-led James Steakhouse. 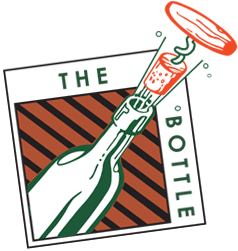 With chefs Andy Howery (formerly of Watercress) and Chris McDonald (Grille 29, New York’s Le Bernardin) at the helm, The Bottle – a name referencing the near-mythic, long-shuttered Green Bottle Grill where Howery got his start – this corner of Washington and Clinton Avenue is back abuzz. And downtown Huntsville just got a lot tastier. Monday – Thursday: 5 – 10 p.m. Friday – Saturday: 5 p.m. – 11 p.m. Recommendations: Angus Beef Filet Mignon, Georges Bank Jumbo Sea Scallops, Pastrami Cured Yellowfin Tuna, Triple Cheesecake. Suggestions: If you have to skip a course, skip the salad. Alcohol: Full bar with extensive wine list. Price range: Main courses $20 – $46.